The moment you step into Lumel Studios you can tell this is not your run-of-the-mill glass blowing workshop. 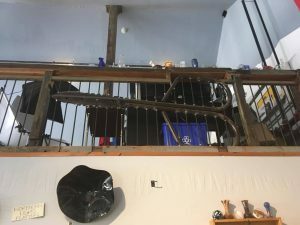 From the salvaged Land Rover and recycled wood picnic benches out front, the repurposed wooden beams throughout, or the stairway railings made of rebar left over from the concrete floor installation, the studio is overflowing with recycled and repurposed elements. “I like that everything has a history. 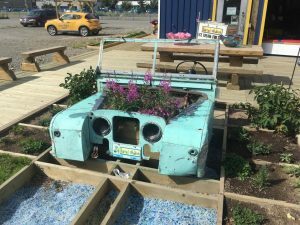 It voices what it was in the past,” says owner Luann Baker-Johnson, who set out to create a new and welcoming space that also incorporated reuse and sustainability. 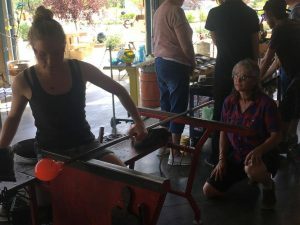 “As a glass blower, we know we have a large footprint… So then how do you offset that in absolutely every way you possibly can? One of the ways we did that was to recycle, reuse and repurpose absolutely everything from the build. With careful planning and efficient use of building materials, Lumel managed to create a unique and beautiful studio while spending only 40 dollars on tipping fees at the landfill. Careful cutting of drywall, reusing old furniture and salvaging items from several different sources were some of the ways Lumel managed to create a space that exudes character and embraces the value of creative reuse. Lumel’s waste reduction commitment didn’t stop after construction finished. In the studio, they work hard to recycle every piece of glass they can, minimize waste, sort glass for reuse, and sell used shards to the public. 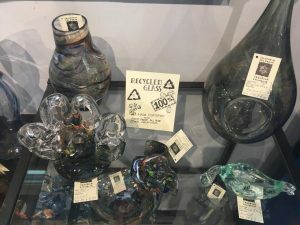 They have many pieces on display made of 100% recycled glass and have also created new pieces from the shards of items that were broken during the earthquake in May. 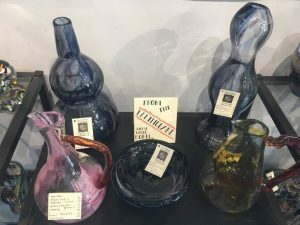 They are even working on repurposing several depression-era glass pieces that were broken in the quake, hoping to bring a 21st century touch to antique glass. 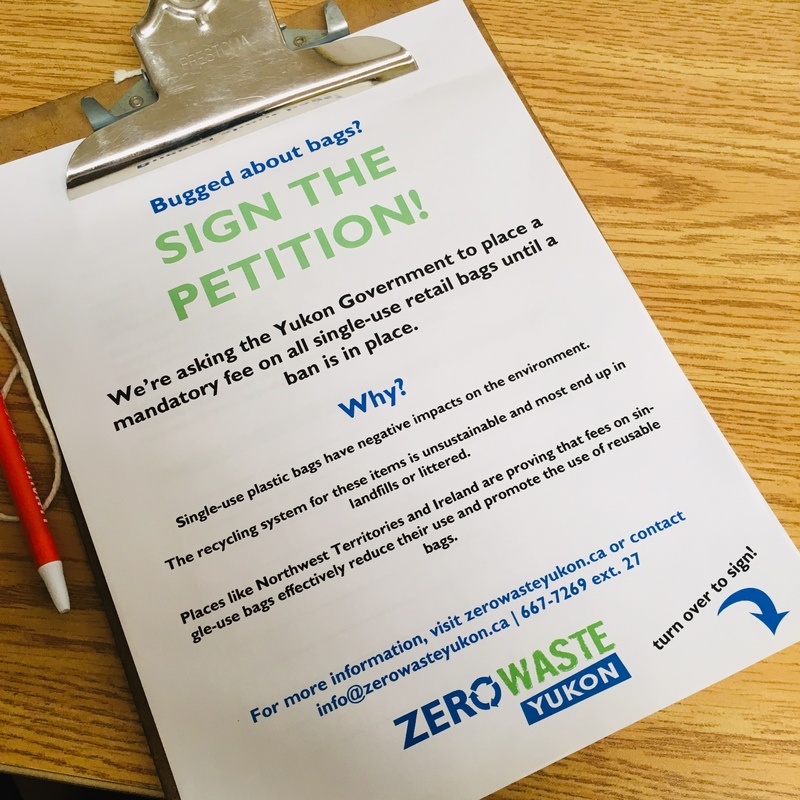 They even ship their glass in salvaged styrofoam and plastic wrap, proudly displaying on each package the fact that they are shipping Yukon’s waste south to their customers. “We’re very proud of the fact that we’re packing pristine glass in a reused product… It gets everything there so why wouldn’t we?” says Baker-Johnson. In this way, Lumel is helping to break down the stigma surrounding used goods. They are showcasing the value of recycled material and saving money doing it. Lumel is not only a leader in sustainability, they also pride themselves on having a strong social conscience. Baker-Johnson learned to blow glass after a family tragedy, and extolls the healing properties of working with such a medium. “Ceramics is my comfort, working with clay is quite comforting, and glass is the struggle. And I think in life and for healing you need both. Glass has been a healer for me…it takes your whole focus and there’s nothing else in your head. Lumel regularly holds workshops and demonstrations for street people, disenfranchised youth and the elderly, and has gained the label ‘The Happiness Factory.’ In this way they’ve created a space built on the values of diversity and inclusion, as well as sustainability. They work with animal and human ashes, creating unique pieces to commemorate customer’s loved ones. They have surrounded their studio with a community garden that hosts berries, vegetables and herbs. They also support Habitat for Humanity by creating unique glass pieces for each home built for Yukon families. Lumel has two main short term goals for the future. 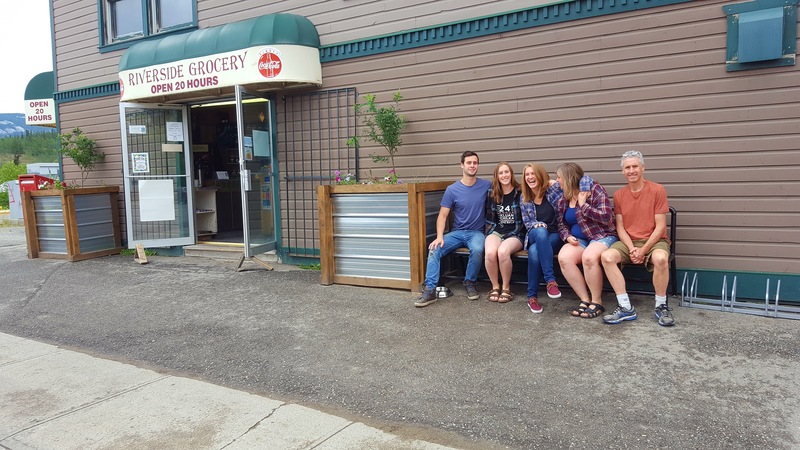 First, to build a portable recycled glass blowing studio they can bring to every community in the Yukon. They also want to develop the other half of their lot into a recycled glass blowing studio. 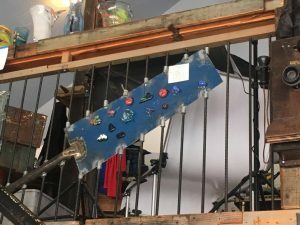 Baker-Johnson estimates the new studio could start out using 2000 – 3000 pounds of recycled glass a month and she hopes that one day they will be shipping recycled pieces such as glass bricks out of the Yukon as a commodity. It’s easy to see why Lumel has been successful. They have thrived as a diverse and inclusive community studio. 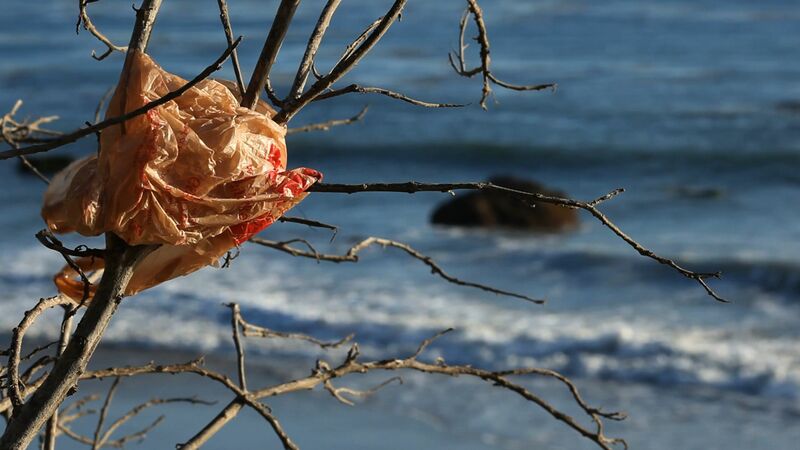 Furthermore, they are a glowing example to other businesses of how the shift towards Zero Waste can be undertaken creatively and successfully. 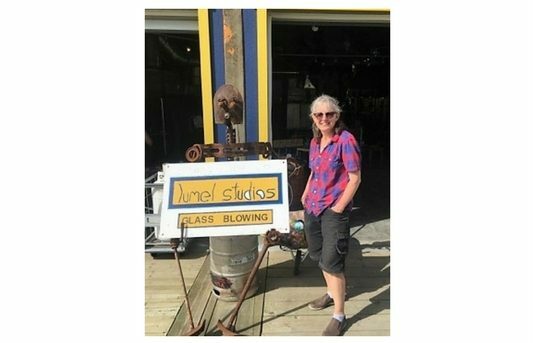 Lumel Studios is located at 101 Keish Street, Whitehorse, Yukon. Contact 867-633-2308 or visit www.lumelstudios.com for more information.